PrivaZer is a surprisingly powerful privacy tool which can reveal the many traces of activities left on your PC, before helping to clear them up. After running a thorough scan of our system drive (potentially a lengthy process, taking 1:57 even on our relatively unpopulated 240GB SSD), the program produced a detailed report of areas which required cleaning: everything from cookies, browser and instant messaging history, to the MFT, drive free space, our Registry and even RAM. There's a huge amount of information here. Curious about your Registry issues, for instance? Click Registry > Traces and you'll see the program has run a low-level scan of your Registry keys: on our system this successfully identified a host of programs we'd uninstalled long ago. 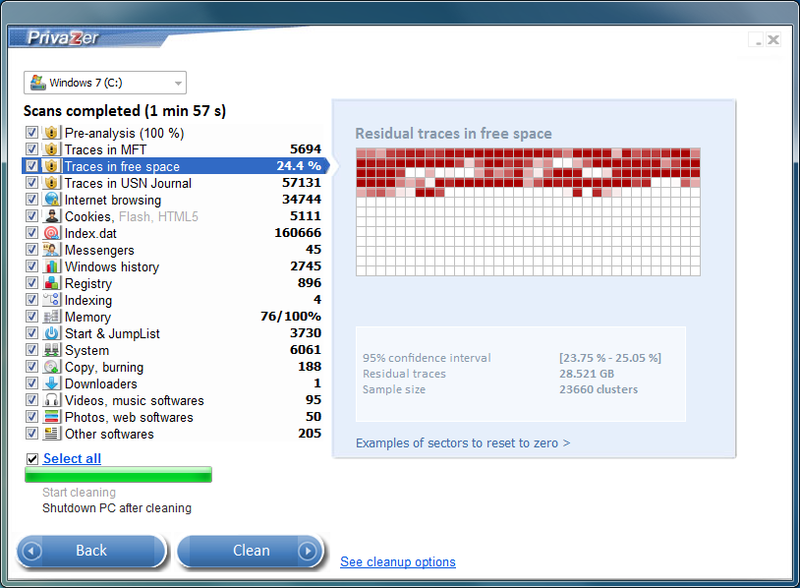 The "MFT" and "free space" sections are similarly thorough, revealing the names of deleted files. JumpList scans detail the applications you've run and the files you've opened. And even apparently obvious sections, like "Cookies", are packed with information, listing regular and Flash cookies, DOM storage and more for multiple browsers. And once you've finished browsing, all discovered traces can be overwritten with a click. Or you can have the data securely wiped using multiple passes, using one of seven industry-standard algorithms - it's your call. Note that this is the portable version of PrivaZer. PrivaZer is an amazingly thorough and detailed portable privacy tool. Even if you're using something else to clear away your PC traces right now, download it, give your system a scan and see what it can find.